Whether you like them thick and fluffy or thin and crepe-like, everyone LOVES pancake day! Growing up, I always used to look forward to the one day of the year where we would have â€œbreakfast for supperâ€.Â My mum would make the most delicious, hot, fluffy pancakes that we would smother in melted butter and sticky maple syrup, a few pieces of smoky bacon on the sideâ€¦ heaven on a plate. 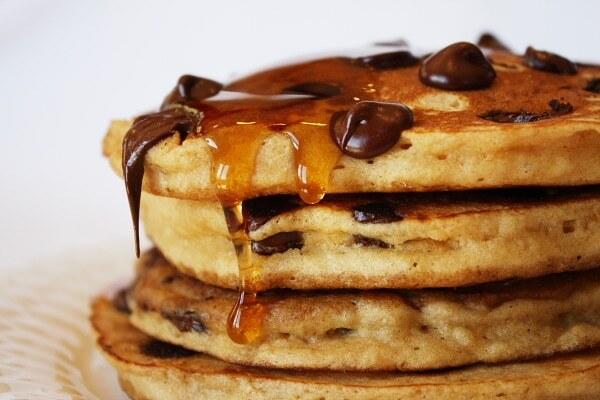 These days, my two little â€œbeansâ€ LOVE pancakesâ€¦ and I mean LOVE with a capital LOOOOOOVE. Every Sunday morning, our ritual is to wake up early, have tea & biscuits in bed, followed by pancakes for brunch. We make big fluffy ones that soak in all the delicious sticky goodness that you can pour on top. My eldest is a big fan of chocolate chip pancakes, while I tend to make a slightly healthier version for my youngest with mashed bananas and blueberries. The best part is that I make lots of extras and put them in the freezer so that they can be reheated in the toaster â€“ a perfect quick hot breakfast before school! There is nothing better than lingering over brunch with my loved ones â€“ delicious food, gorgeous coffee (in a cafetiere with a Couva of course! ), great moments with family. It puts a smile on my face just thinking about it! My favourite â€œgo-toâ€ recipe is a slightly modified version of the one found in the Delia Smith book â€œHow to Cookâ€. Add in lots of toppings while youâ€™re cooking the pancake: blueberries, chocolate chips, sliced banana, raspberries, sliced strawberries, raisinsâ€¦ the possibilities are endless. Or you can mix flavours into your batter before cooking â€“ mashed bananas are great, orange zest and dried cranberries, raspberry jam and flaked almonds, cinnamon and chopped apples and raisins. If you prefer savoury flavouries (!! ), what about mixing in some grated cheese and some crumbled baconâ€¦ yum! And pancakes donâ€™t have to just be for breakfast or pancake day! They make a really great dessert with some ice cream and chocolate sauce. Cooking pancakes as a family is also a great opportunity to involve little ones in cooking â€“ measuring ingredients, learning about different textures, helping with mixing, etc. Iâ€™m getting hungry just thinking about them! Happy flippinâ€™ pancake day everyone! In a large bowl, whisk together the flour, sugar, salt, and baking powder. Add in the egg, milk, and melted Â butter. Mix everything together, just until everything is combined. You donâ€™t want to over-beat the batter â€“ itâ€™s ok if some dry ingredients are still visible. Heat up a non-stick frying pan or griddle pan over medium-high heat. Pour Â¼ cup of batter on the pan for each pancake. (*if you are adding anything to your pancakes, like chocolate chips, or sliced fruit, add it now). As the pancake cooks, youâ€™ll see bubbles starting to form on the surface of the pancake which tells you itâ€™s time to carefully flip it over. Youâ€™ll also notice that, if you sneak a peak under the edge, the cooked side is getting lovely and golden brown. Cook the second side for about 30 seconds to 1 minute or until golden. When cooked, serve them immediately, or you can put the cooked pancakes on a plate in a warm oven until they are ready to serve â€“ no one likes cold pancakes! Serve these with warmed maple syrup and butter, or some Nutella, or whatever else you fancy!